ABOARD THE CHICHAGOF DREAM — The next day we wake up really early because we’re still on Eastern Time: 4 hours difference. First thing I do is call the airline because supposedly a flight has arrived. But the airline says no, the bag did not make it and in fact they report that they think the bag is in Boston and no one can figure out why the bag is in Boston. The first two legs of our flight were on American, and the last was on Alaskan Airlines. Not much more I can do to remedy the situation, so we spend a couple of hours walking around the port city of Juneau. There are a couple of the big cruise ships in town and tourists everywhere. No shortage of memorabilia to purchase, much of it made in China. But it’s a warm, sunny day, and a pleasant relaxed atmosphere that we enjoyed. As the time for departure approaches, there’s no choice but to join the group at the State Museum where we have some time to view an excellent presentation of historical artifacts for about a half hour. Admission was arranged by Alaskan Dream Cruises. We then board a bus to go to the Mendenhall Glacier which is part of the Tongass National Park. We had a great view of Nugget Falls and also I got to put my hand in the glacial cold water. All the while, I’m thinking that the next step is boarding the ship for 10 days without my luggage. 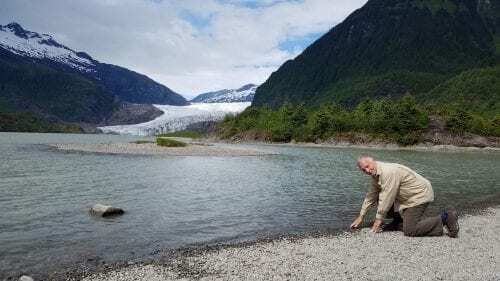 Len finally makes it to Alaska…. I discussed the dire matter with a member of the Alaskan Dream Cruises staff and she quickly arranged for a van to take me to the Fred Meyer local department store where I was able to buy some socks and underwear and t-shirts to hopefully get through the next couple of days until (optimistically) my luggage will appear. I thought that was a very accommodating thing to do. By the way, the prices of items in Alaska are not to be believed. If you think you might bring just minimal stuff and buy other things in Alaska forget about it. Tee shirts were going for $20 a piece. The same kind of tee shirts would normally be three for $10. We board the Chichagof Dream, our cruise ship, and shortly thereafter were underway. Dinner is at 6:30 pm and we get a chance to see our fellow travellers. There are about 45. The ship can accommodate about 75. The lack of formality on this ship immediately pleased me. People are dressed in what I would call Bass Pro shop splender. Our waiter is Jordan and he is quite personable, yet not intrusive. Very sharp. He even gets my subtle humor. Points for Jordan. When we were somewhat undecided about which of the delightful choices to select, he suggests that it would be no problem to get partial portions of multiple choices. Great idea, Jordan! The main choices are pistachio crusted ling cod, seared duck breast, and ratatouille. We chose the first 2. The duck was my favorite. A complimentary glass of wine was a welcome addition. That, or beer, comes with every dinner meal. We used the same decision making process for dessert choices: all of them please. Cheese plate, cinnamon apple crisp, and some sort of triple chocolate dessert. Time for bed, even though it’s still light out. Hey, it’s Alaska in the summer. Land of the Midnight Sun.